For those of you not aware, A Slenderman Musical is out now. Give it a listen. If you like it, buy it! Support the artists who have worked hard on this. Okay, a few notes on the Zoe & Timothy banter, which is actually my favorite part of the piece. For this project i did something i haven’t done before, i made a detailed, written outline of everything up until the end of the 2nd act before i started on any music. 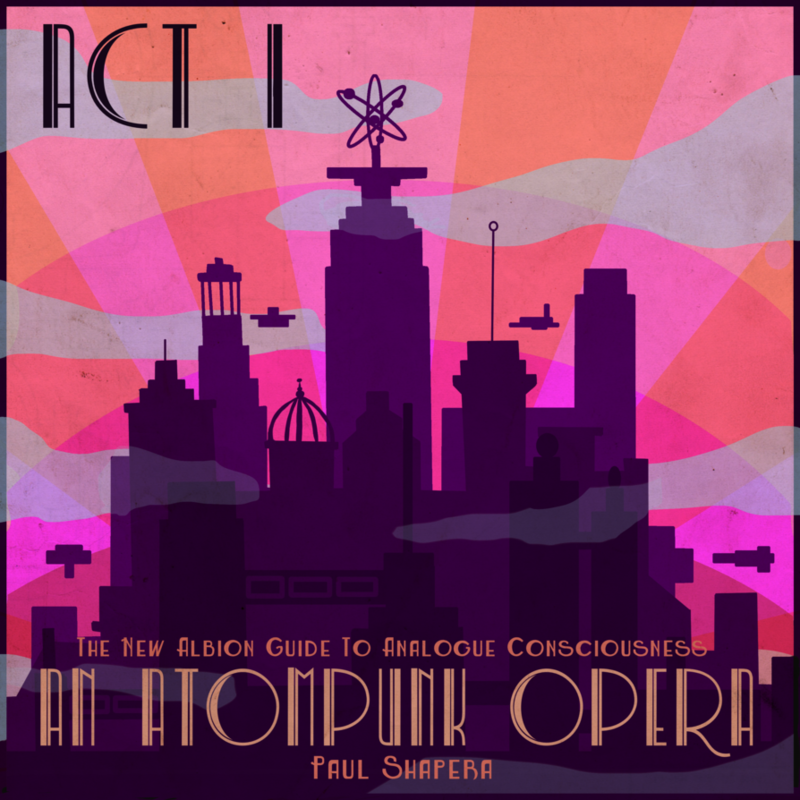 I did not do the 3rd act because, and here’s a dirty little secret, except for the Atompunk Opera i have never known what was going to happen in the final act in ANY of these operas, and do not figure it out until i am well over half way through composing the piece. I don’t mean to do this, it’s just how it works out. There is a great degree of things that happen while working on a piece that you cannot plan for, that happen spontaneously during the course of creation and that you should respond to as it happens. Let this new unforeseen thing live. Let it change the piece even. The Zoe & Timothy banter is one such thing. In the outline, Timothy died at the end of Act 1. That was it for him. Spend an Act building him up then kill him. It’s a horror trope thing. Zoe takes over and that’s all there is. I had three volunteer listeners this time around (plus Kevin Hulburt, who i always sucker in), and when i sent them the outline, Christopher Webster in particular made a very impassioned case for keeping Timothy around. Later, when i sent the first act demo out (but before starting on Act 2), Kevin Hulburt too made an impassioned plea for keeping Timothy in the game. When i ask for feedback, the truth is, i’m going to ignore 90% of what you say. I’m looking for that 1 out of 10 comment i didn’t consider which makes a bell go off. This was different. But… two impassioned pleas for Timothy… hmm. I considered what to do with him. I did have a problem with Zoe that needed work. Act 2 has 3 character arcs: Jordan, Samuel and Zoe. Jordan and Samuel’s acrs are clear, but all Zoe really does is find her way to the Librarians. Not much arc. She could see the Abbey along the way and allow me to paint it a bit… all right… it’s not a character arc but maybe i’ll forgo an arc and just do this. This is where the important thing happened. I liked the Zoe & Timothy 1 banter. It wasn’t the first of many back and forths, it was just the one. But i liked it. And i went away for a weekend to some mountain and sat out drinking a beer on a balcony by myself at night thinking about the piece, and that’s when i came to understand something very important: Not only was the Zoe and Timothy discussion really good and i should do it more, but it’s the most important part of the entire piece. The piece is missing a heart. The back and forth, the friendship that grows between Zoe and Timothy through their banter, which i should put EVERYWHERE I CAN, is the heart of the entire piece. The musical is really about alienation and connection. Alienation is the killer. It drives Timothy to despair, almost to the end of his road. It destroys Jordan. It takes Samuel down, all in their ways. By forming a honest connection, Zoe and Timothy are able to make it through. It is their connection that makes this possible. Alienation causes all the troubles in the musical, even Mother suffers from it and sends her tall, thin son to solve it for her. Connection saves everything in the piece, including stopping the Slenderman attacks, and it is Zoe and Timothy’s bond that is the seed from which all other connections in the show are made. Furthermore, i’m going to build that connection to a point where i am going to make a love song between a straight guy and a lesbian with absolutely no sexual tension whatsoever, no romantic anything at all between them, just an honest bond forged from mutual respect in dire circumstances. And with that, my understanding of what i was doing writing this musical truly came alive. The banter is designed to seem to fill the cracks between plot holes, which is misdirection, because as far as i’m concerned, it is the most crucial aspect of the show, without which those plot points lack a heart and soul to bring them together. So there you go, my thoughts on the Zoe and Timothy banter. Oh yeah, if you haven’t listened to the musical a few times through, uhm, spoilers. 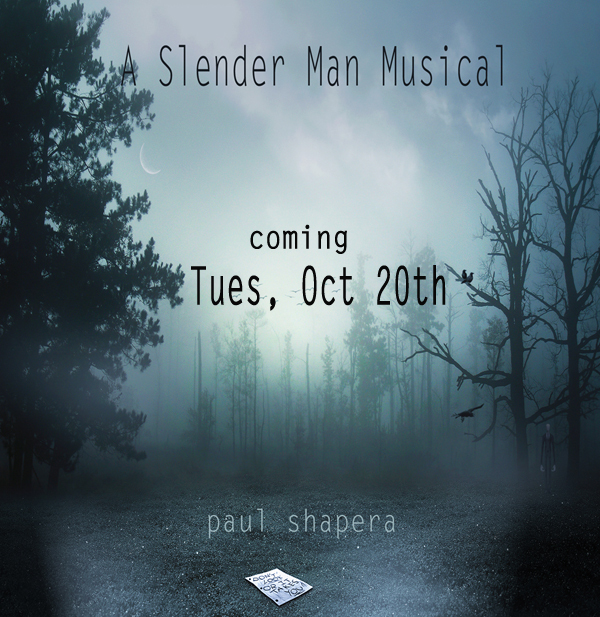 A Slenderman Musical Release Date: Tues. Oct 20th! We’re down to our last vocalist, the wonderful Tiffany Williams recording her parts this weekend. I forgot to have Lauren do one 4 second spoken bit, so she’ll also do that this Monday (maybe one other 5 second bit too). Oliver Marsh, who plays Samuel is done. Jeff Simms, the harmonizer for the Redneck Chorus (we’ll talk about that tomorrow. 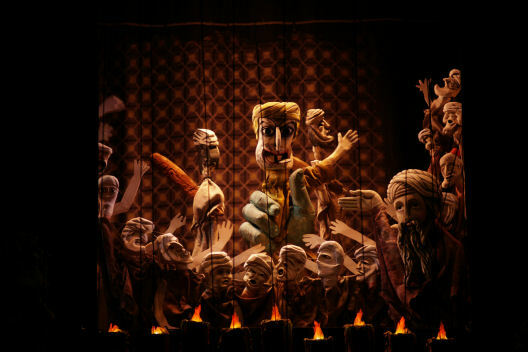 It’s the version of the Greek chorus i use for this piece) is done. Rachel Hughes is done. Matthew Broyles has his guitar parts all finished… i’m really just cleaning up the tracks now. (Although i cannot tell you how long THAT takes. I can write an entire track in 3 days but spend the next 3 months cleaning it up). It’s long. The running time is 2 hours. I try to make these things 90 minutes, but ever since Dolls that keeps growing and growing. I couldn’t make this shorter. I recommend listening to it in Acts. Anyway, get the word out, any and all help spreading awareness across the internet is GREATLY appreciated. Like, hugely. All my love to you, my sweets. Soon. Soon we shall be together again… in strange and inappropriate ways. I love to play with Narrators. I’ve always loved to play with Narrators. When i was a teenager and ran across the Bob Fosse holy trinity of Narrators (Cabaret/Pippin/All That Jazz) i was utterly fascinated, inspired and immediately set about playing with them in my own work. I really have a thing for when Narrators become a meta elements, more than just a voice doing a job. It’s not that the guy has a big part, but it’s just so… memorable and fun and awesome. This is classic example of the kind of playing with the Narrator i love. He starts off as a straight Narrator, but dips into the play every so often as the long lost father figure. The two roles can strangely coincide at moments but THEN, in one of my favorite moments in musical theater, the cast, who’s getting absolutely buggered in Act 2, decide they don’t like how he’s telling the story AND KILL HIM. OMFG i LOVE this idea. On the other hand, i am seething with anger because they thought of it first and now i can’t do it without ripping them off. Bringing a book into this is a bad idea. Literature opens up a whole nother universe of Narrator possiblities and examples i can’t afford to get sidetracked on right now. But i must. I really must. The reason why is there are quite a few examples of the Narrator actually being the author and actually inserting themselves into the work itself in order to converse with the protagonist. Cerebus, Animal Man, The Dark Tower series, the list goes on. It’s a rarely used trope, but it’s out there and here’s the thing: Vonnegut did it first (i believe) and went so batshit with it, no one has come close to touching the jaw dropping existential awesomeness in which he did it. I can’t talk about playing with Narrators without bringing up Breakfast of Champions, i just can’t. This one isn’t actually a Narrator. At all. Hell, you can’t ever really understand him. And yet conceptually… conceptually he IS like a Master Of Ceremonies existing on another layer of reality, a sub-level to ours. He is the go between between that level and this one and the entities who exist on both. He’s… he offers the most heavy conceptual ideas of how to play with MCs and the most creative and wild speculations. He is a huge influence in ways that cannot be put into words. What is not to love about the Narrator? Every line he delivers is gold to be quoted and requoted. He belongs in an over the top John Wayne movie but is instead describing The Dude and helps to strangely sell the idea that this lazy, washed up hippy reject does in fact, against all first rational impressions really have his thumb on a higher spiritual way of Being. Also, i reiterate, every time he shows up on screen i want to memorize every word he says and say it about people i know while walking along beside them. This SHOULD be number one. It really should and i apologize for that. The others had a more personal impact on me so they’re getting the higher rating, but if this list were objective, this would be number one. You cannot hold a discussion, a real discussion, about playing with a Narrator and various Narrator tropes without using discussing the Stage Manager. I’ll even go so far as to say the Stage Manager is the archetype to which all else is compared. I… i can’t even begin to discuss The Stage Manager because you can’t start talking about how the playwrite (Thornton Wilder) plays with the Narrator and stop in less than a half hour. The Stage Manager is EVERYthing… guide to the audience, dipping into the action, key to our understanding of the world we’re witnessing, an omnipotent catalyst (for Emily’s Day)… the town itself evolves a consciousness and that consciousness has a certain amount of godlike attributes and THAT is the Narrator. Everything i did with Lloyd the Narrator in the Dieselpunk Opera ultimately traces back to seeing Pippin when i was 15 years old. I loved the songs, i liked the whole artist finding himself thing,. but HOLY SHITBALLS the ending BLEW MY LITTLE 15 YEAR OLD MIND. Seriously, it was the end of Pippin that did this thing to me that changed everything and set me upon a certain course and set of ideas that not only guided a whole shitload of my artistic explorations but culminated years and years later in The Dieselpunk Opera. This Narrator is not 4th wall breaking, not meta or mystical or omnipresent or any of the fancy things all these others are. He is just simply a Master of Ceremonies. But no other single Narrator inspired me to the degree the MC from Cabaret did. He’s dark. He’s decadent. He IS in control of the show and he is strangely… otherworldly. But not in the usual fantastical ways i often enjoy. It’s just a great character built so well by the original Joel Grey. He’s a blueprint for an archetype which i imagine has also inspired reams of other artists creating and playing with Narrators.